If you’ve been following along, you know that I am currently training for my second half marathon, coming up in March. Last time, I just sort of winged it. I had a loose plan (read: very loose), that I somewhat followed. I didn’t get all my long runs in because I was dealing with a quad strain and physical therapy. I survived the half marathon and even made my “in my head” goal but, this time I want to be better prepared. 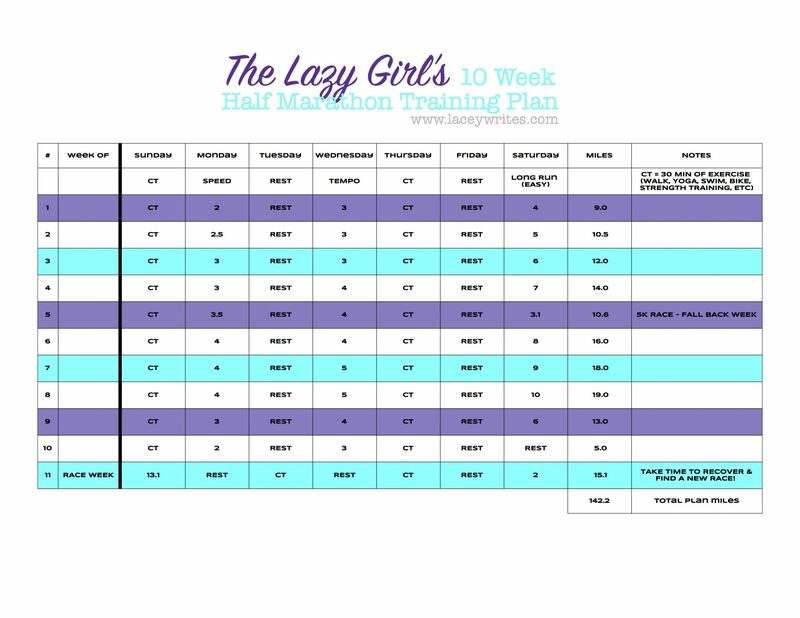 Having been through a half before and knowing what my crazy schedule looks like, none of the plans I found online “fit”. So, I took a little bit of this one and a little bit of that one and made my own. My plan includes 3 runs a week with a long run on Saturday, plus 2 days of cross-training and 2 days of rest. It remains flexible, though, it has to. My schedule is all over the place and some days I just don’t have the energy needed and opt for more rest instead. So far, it is working out wonderfully. I finished my 5 mile “long run” this past weekend and am cruising along. I’m getting stronger and faster and hopefully will PR in March. We shall see. If you’d like to follow my plan, you can download it here. Or, you can download/save the Google Sheets version here. Be sure to FILE–>MAKE A COPY and change it up to your heart’s content. February 2017 | Fitness Goals - lacey writes.